Sequel to the award-winning MOTHER OF RAIN. When it is a healing they need, the people at Christian Bend, Tennessee, turn to one woman—Burdy Luttrell. Melungeon by birth, Burdy learned the therapeutic properties of roots from the women in her family. When Burdy discovers that Lincoln Memorial University is hosting a class on healing roots, she persuades her friend, Mayne, to drive her up. The two women make a fateful stop at Laidlow Pharmacy at Bean Station where an armed gunman executes three people and critically injures another. Burdy—the woman able to cure others—is now fighting for her life at University of Tennessee Medical Center in Knoxville. One thing is keeping Burdy alive—she has to tell Rain, the boy she has cared for since birth, the secret she’s kept from him all these years. Rain was a deaf toddler when his father Zebulon Hurd was reported presumed dead following the Normandy Invasion. The news sent Maizee Hurd, Rain’s mother, headlong into a mental collapse from which she never recovered. 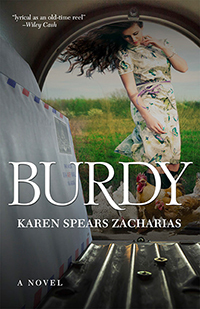 When the now grown Rain gets word that Burdy has been shot, he leaves his job in Rhode Island and rushes back home to Tennessee, completely unaware of Burdy’s secrets and how the shooting at Bean Station will transport them all to another time and place—1950s, Bayeux, France. Karen Spears Zacharias has crafted a mesmerizing novel of tragedy and transformation, a beautiful rendering of fact and fiction, and a tenderhearted narrative of survivors and the battles they face.